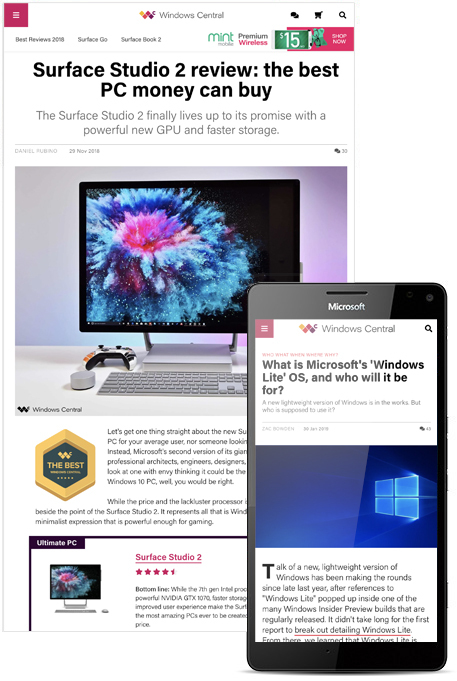 Home to the most loyal and passionate fans of Windows and Microsoft, Windows Central is the next-generation consumer destination for news, advice and buying recommendations for Windows products and accessories. The labyrinth of products running Windows is seemingly endless. Windows Central guides you through the menagerie so that you're spending your money on the right products, at the right time, and always with an eye on the future. We look at the Windows family in detail and give several tiers of advice based on value and different audiences, based on profession and use case, how much money you're looking to spend, and some hidden gems that might otherwise have been overlooked. Windows Central's Editor in Chief, Daniel Rubino, represents the next generation of Microsoft and Windows pundit. Passionate, knowledgable, well-known and well-respected, Daniel and his team are leading the charge that truly is making Windows Cool Again.